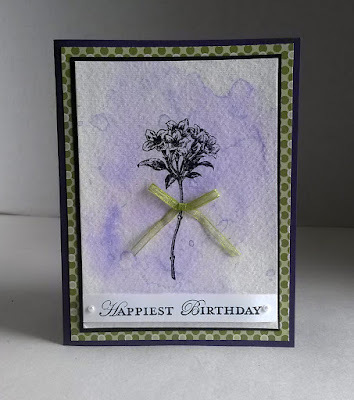 Adding a watercolor-type wash across the background of a card creates a wonderful look on which to stamp a single simple image. Using inks instead of watercolor is easy, even for the most novice of crafters. One of the nicest aspects of this technique is that it is different every time it is done. There is no way to reproduce the exact look. And none of them would be wrong. 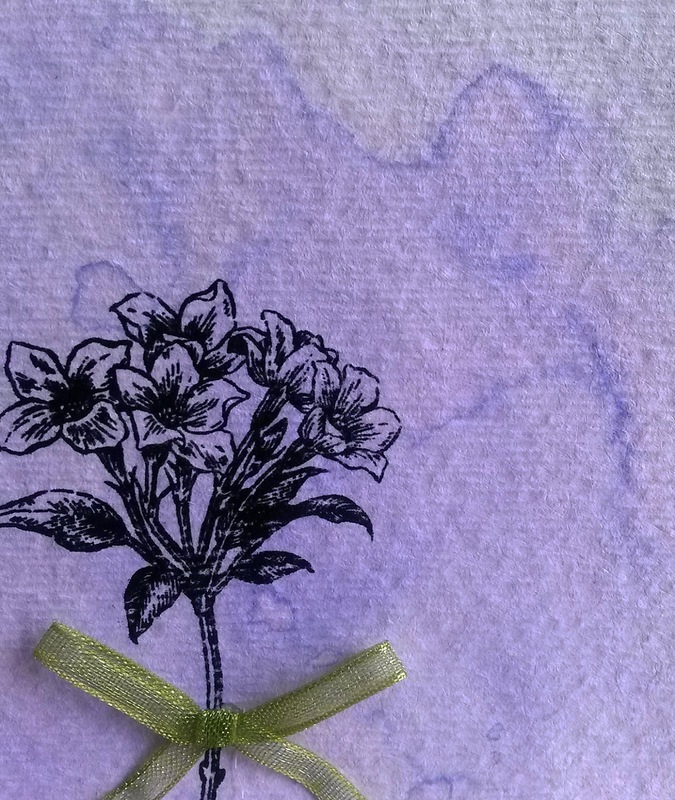 Once your background is dry, it is time to grab a stamp! 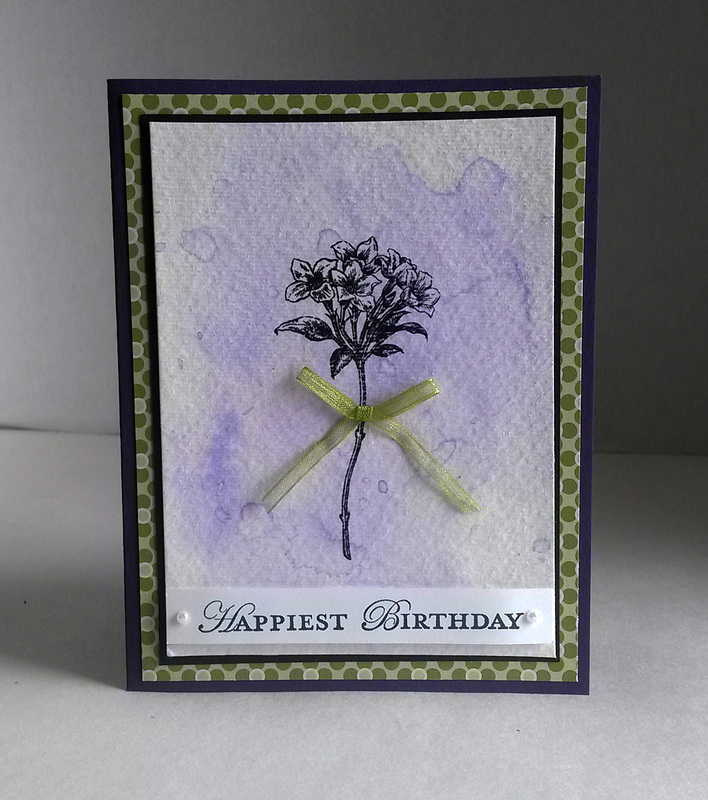 Another effective look for this type of background would be to add a diecut of some sort instead of the stamped image, for example, a cluster of flowers or weeds in black paper. Just experiment! I am including the supplies for what I actually used on this card. Feel free to try any color combinations that you love! Fold a 5 1/2" x 8 1/2" piece of Elegant Eggplant cardstock in half, creasing well with a bone folder. 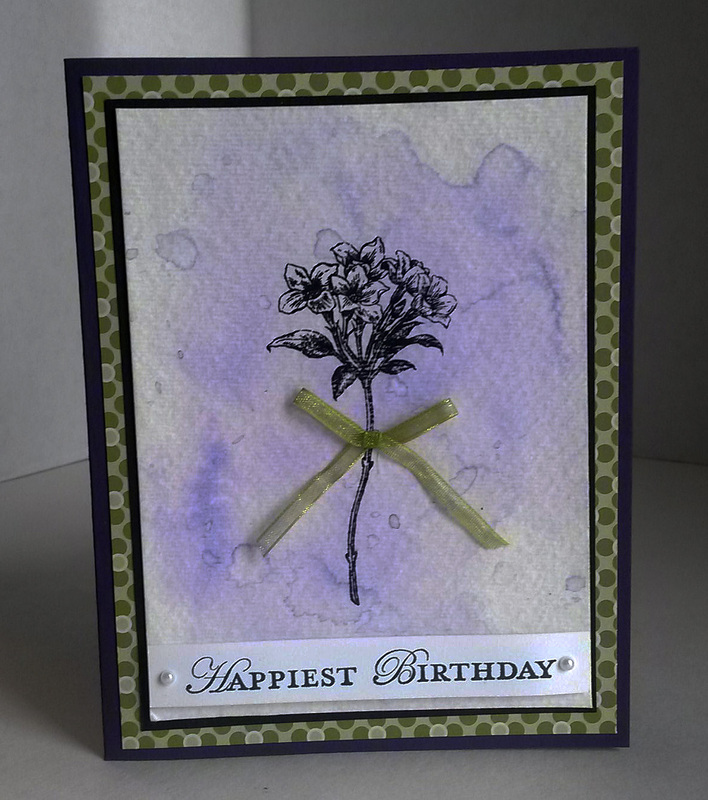 To this card base, add a 4" x 5 1/4" piece of green Designer Series Paper. Using a 3 1/2" x 4 3/4" piece of 140 pound watercolor paper, mist it well with water. Then, with an Aqua Painter, pick up a bit of reinker and drop it onto the wet surface, immediately moving it around with the Aqua Painter, even picking it up and tipping it so the ink runs. Let it sit a few moments. Dry it with the heat tool. If you don't like the way it looks, repeat the process. 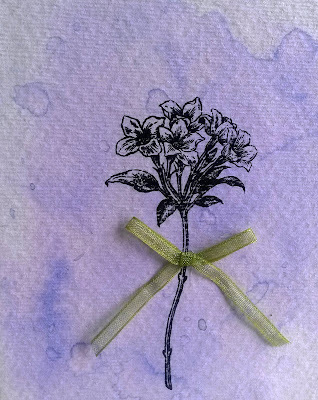 HINT: If you are doing this over a heat-resistant sheet, as you are dripping the ink off the paper and it lands onto the sheet, you can dip the paper into these drips to add interesting spots of ink. Keep doing this all and drying it in between until you are happy with the look. 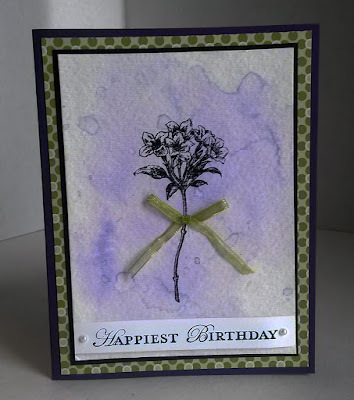 Stamp the flower stem stamp in Memento Tuxedo Black ink over the dried background. Tie a bow from thin ribbon and attach it to the stem with a Glue Dot. Once this piece is completely dry, add it to a 3 5/8" x 4 7/8" piece of black cardstock. Adhere this to the card base. 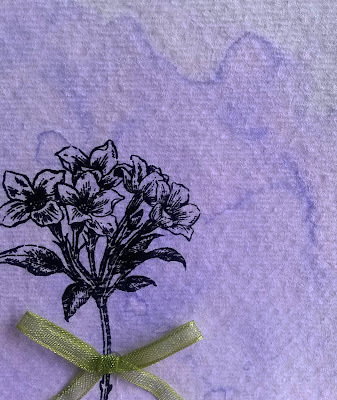 Stamp the sentiment onto a 1/2" x 3 1/2" piece of Whisper White cardstock. Add it to the bottom of the watercolor piece with a couple Stampin' Dimensionals. Add two Basic Pearls to the sentiment strip. You're so crafty! This is very unique, I love it. Oh I like that, very pretty. Thank you for sharing this post at the #WednesdayAIMLinkParty. I pinned it. Such a fun technique; I have never tried that one. That is gorgeous. So very creative. Thank you for sharing at the #BloggingGrandmothersLinkParty. I have shared on social media. I like the spots of ink better than if you had just made it plain watercolored. Very inventive. Thanks so much for sharing with us on #FridayFrivolity. Beautiful card! Thank you for sharing at Ravenwould. You always make the most beautiful cards. Love this technique Thanks for sharing at Over The Moon Party. Watercolor backgrounds are always so pretty. Beautiful card! This is a really pretty technique - thanks for sharing with Awesome Life Friday. I am a huge watercolor fan and hope that it stays trendy for a long time. Thanks for sharing your technique and thank you for sharing with us this week at Celebrate Your Story, have a great weekend.